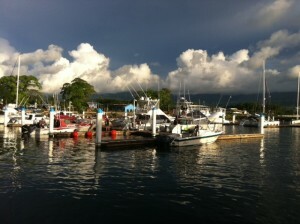 As Day 2 kicked off I managed to pick up a great breeze which took me under sail all the way to 5 mile reef. Yesterday that took me just under 2 hours to peddle. However unlike yesterday, there were no fish showing on the sounder so I decided to keep going beyond the 1000ft drop off, and ended up 25kms off the mainland in some of the deepest and bluest water I’ve ever seen. The fishing today was tough, I saw plenty of bird and bait action, but the wind dropped off completely about 10am which meant I could only get 3 knots peddling speed, unfortunately not enough for pelagic trolling speed. After 7 hours straight peddling, I did something a bit off centre, and set course for a brewing storm to catch the wind and cool off. An hour later I was legs crossed on the peddles, and lying back cruising a comfortable and cool 7 knots with three lines out on the troll. Back at the club there was a heap of interest in the kayak, word is getting around now that some crazy Aussie is actually entered into the competition as a kayak. 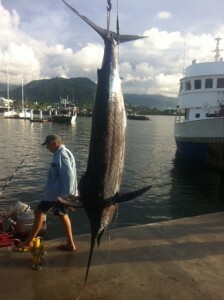 At the weigh in, one boat brought home a 125kg Blue Marlin, a sensational catch. 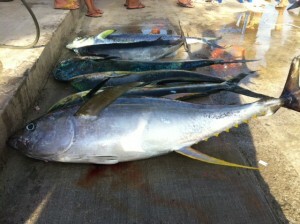 Others scored some big Masi-Masi and one boat landed a 65kg Yellowfin Tuna. 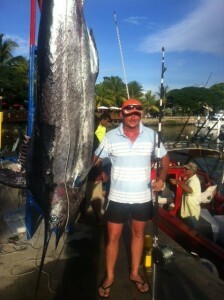 For 33 boats (including the kayak), not a huge catch but definitley some huge game fish. Tomorrow is ladies day, and that’s great as my legs are very sore and some of the electronics and other gear on the kayak need some maintenance. Thursday we return, and my quest to land one decent fish that can be classed as a game fish, from the kayak, will resume….